My daughter has been keeping a "happy thoughts" jar every year, for the past few years. Whenever something good happens, she writes it down, then puts it into the jar. At the end of the year she will go back and reflect on all the good that happened throughout the year. She's had a crummy looking jar since she started, so I decided to make her a prettier one for Christmas this year. She just loves Peter Pan, so I thought it would be fitting to make her a Peter Pan Happy Thoughts Jar! I cut some Peter Pan Silhouettes out of vinyl with my Cameo, along with the happy thoughts saying, then popped them onto a glass jar. If you don't have a cameo, you could always print out the design you want, tape the paper to the inside of the jar, then trace the stencils on with paint on the outside of the jar. Easy peasy too, just a little more time consuming waiting for it to dry. Fill it up with all your happy thoughts throughout the year. It doesn't have to be handwritten notes either. Pop in some ticket stubs, charms and trinkets. Whatever reminds you of your happy times! For less than $5, she has a custom happy thoughts jar that she loves! How do you keep track of your happy moments throughout the year? That's so cool! Happy thoughts are great to hold on to! You could also make nut butters to go in the same designed jars for holiday gifts. That is a great idea and I LOVE how the jar came out. That is something she is going to treasure for the rest of her life. A wonderful idea she had indeed, can remember all the good times. Great job on the jar to. Awesome idea. Someone close to me has one that she and her kids write down the best moments on paper and add. They went over them for New Year's and saw what an incredible year they had. I tend to blog/scrapbook my happy moments, and on my blog I recap them each month. I think this is such a great idea and I think I'd like to create one for myself! This is such a cute way to promote positive thinking! It's so easy to fall into a rut of negativity. I really like this idea,It must be so nice to look back and remember all the good things. I love this and I know an adult that would love it also because of the Peter Pan theme. It is also a great idea for kids and adults. I have never seen this and think it is such a cute idea. My youngest would probably do it daily, will have to mention it to her. This is such a great and cute idea. I am a journaler and used to write my days and thoughts. For the last year or two I haven't been able to do so daily. We've also had a rough few years. Maybe if we did this as a family we can look back over our year and realize we have had some pretty good things happen. This is a really good idea. I love how she's been doing it for a few years and then gets to reflect on eveything she's been through! I don't keep track of my happy moments but for sure I remember them!! This is actually a really good idea and I love how you made that jar so pretty! I think that it is a really good idea too. The jar is very pretty and inviting. This is a very cute idea. One of these will definitely help you stay motivated. It's too easy to forget the good things and focus on the problems. I love this idea because it teaches kids to focus on the positives and not the negatives. I'm going to make one for our family. I love everything about this, including that adorable jar! I'm definitely starting one of these. I love Peter Pan. What a sweet idea - we need to do this! 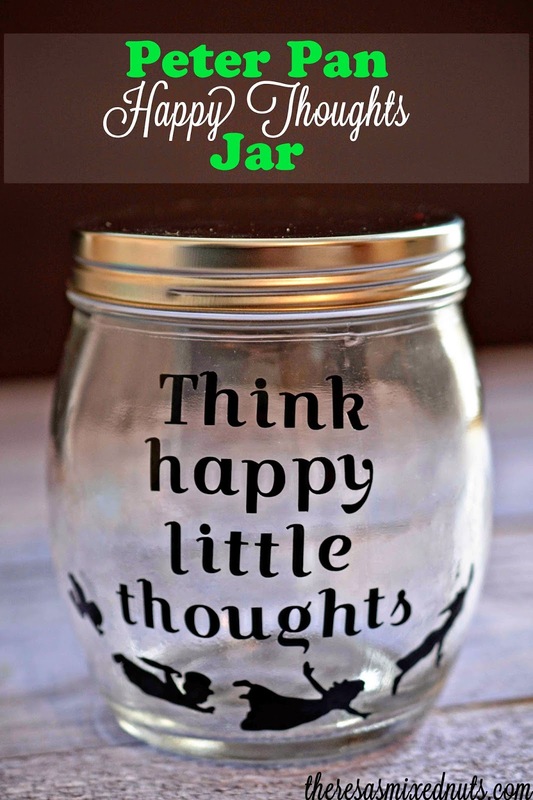 I put my happy thoughts on blog/vlog/instagram :) I like this jar idea too. That's a great way to keep your spirits up. This is adorable! I would love to try something like this with my daughter. This is a cute idea. I love Peter Pan. I have that tattoo (of the kids flying to Neverland) on my foot. Great idea!! So unique and meaningful especially when you have older kids that forget about the little things in life. I use those cute covered boxes. They usually come in three different sizes but I prefer the smaller ones. My God-daughter uses a cookie jar, while a neighbor uses a large piggy bank. Funny, huh? This is a cute idea. Normally I keep track with lots of pictures! That is awesome. Love the happy thoughts idea. I really like how it turned out! A great idea for my youngest to do. This is so cute. I love the idea of filling a jar up with everything good that happened in 2015 and revisiting it on New Years Eve. This is such a great idea Theresa. A positive thing for kids to do! Love the Peter Pan touch. So cute! This is such a cute idea! Our kids would love making and then using an idea like this! Thanks for sharing. That is such a cute jar & not to mention a great idea! I think I need to start one for myself actually. That is just magical! I love the little jar and I know my kids and I could add a fun story to it. 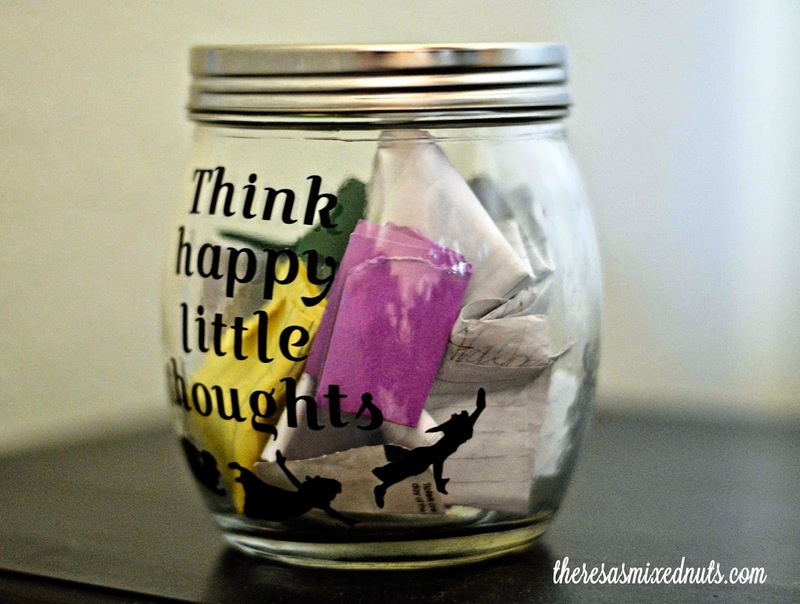 I think a Happy Thoughts Jar is a great idea and I love the way you created it. I have to practice something like this - a very awesome diea! I have all my happy thoughts just floating around in my head. I like your way for happy thoughts better.